Happy National Fresh Fruit & Veggie Month! 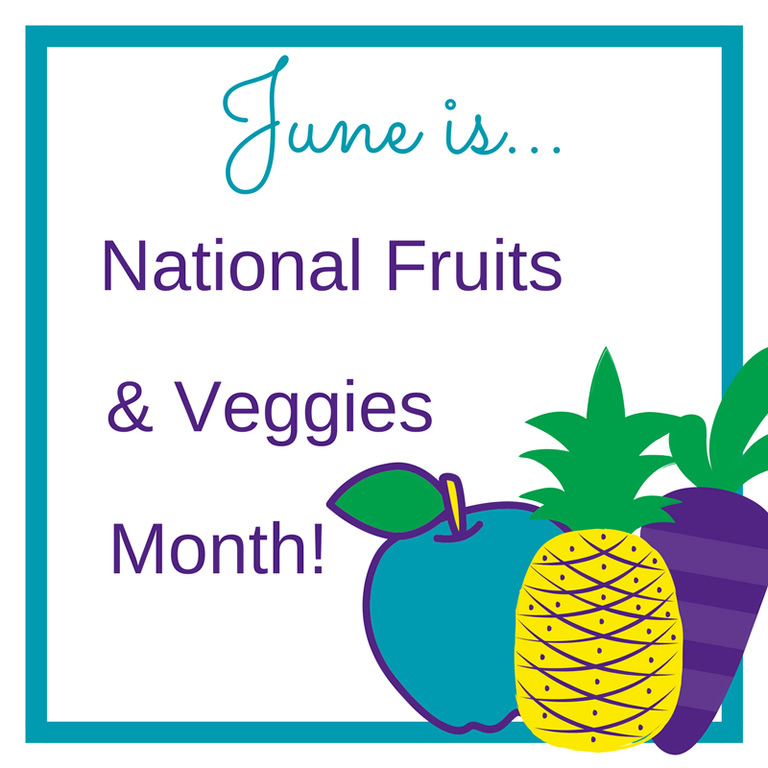 It’s a great month to enjoy those REAL freshly harvested veggies and fruits which are super sweet and yummy. Don’t be fooled though by fruit-flavored snacks, fruit leathers, or juices–REAL fresh fruit is the best choice. Speaking of fruits, remember to choose a variety of colorful ones. You can get your RED, WHITE, and BLUE on (and in) as you celebrate Flag Day (6/14) and next month on July 4th with a patriotic fruit salad of strawberries, bananas and blueberries. And since summer is here (6/21) and the heat is on, stay hydrated with simple, refreshing and energizing water. It not only makes up 2/3 of the earth’s surface, but 2/3 of you. So “chill out” with a glass of H2O instead of sugary, energy-sapping soda, juice, or sports drinks throughout the summer, but especially to celebrate World Ocean’s Day on 6/8. One more celebration in June is Father’s Day (6/18) and just like dads may sleep in on their special day, you can too. Aim for 8-10 hours nightly—uninterrupted sleep is key so get rid of the screens that may keep you up (or wake you up) like phones, TVs, or computers. You’ll feel better and perform better in school—which isn’t quite done yet for many kids, so finish the year strong with plenty of sleep, water, and fruits and veggies. Happy June!